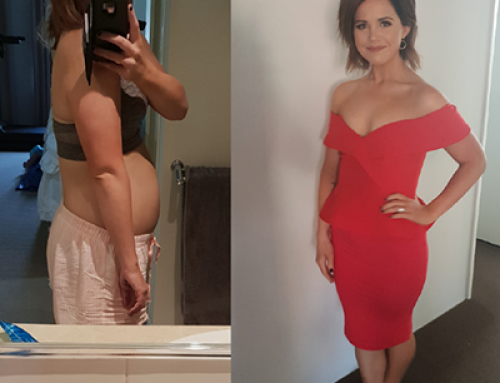 Sarah Lost 10kg in 2 months! I didn’t have a lot of weight to lose, however, I had put on 10kg in the last 12 month due to bad eating and health habits. And I knew it was time to change. I decided it was time to cut out a lot of the sugar I was consuming… The was the day I started The Lady Shake. I am a working Mum with three kids and I only get short breaks with the work that I do which often led me binge eat, going for the unhealthy quick and easy options like a packet of chips or biscuits. I needed something that would keep me full and that was quick, easy and convenient. The Lady Shake is just that – simple and gets the job done! I also started interval running 4 km every day and cut a lot of sugar out of my diet. I am also using my fitness pal logging my calories I have been snacking on corn cakes, snow peas, and low-calorie yogurt. I went from 67kg to 57kg. Photo were taken 13th October and 13th December same pants.